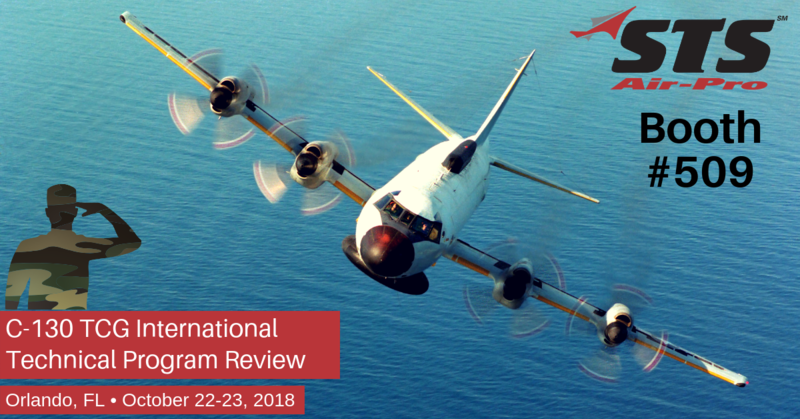 STS Aviation Group is returning to exhibit at the 2018 C-130 TCG (Technical Coordination Groups) International Technical Program Review. STS is very excited for the opportunity to put its products and services on display at Booth #509 during the event. If you plan on attending, come meet the STS team and learn all about what makes us the company with “Solutions to Keep You Flying! This annual event provides opportunities for Foreign Military Sales (FMS) customers, supporting vendors, TCG staff, Department of Defense (DOD) employees and U.S. Government organizations to discuss topics of common interest, obtain and exchange technical knowledge and receive information on new or improved technologies critical to the worldwide operation of the C-130 aircraft. Participants and guests of the conference can take in more than 150 exhibitor displays inside the Caribe Royal Hotel and Convention Center. You can also expect informative defense industry sessions related to avionics upgrades, aircraft modifications, material sustainment solutions, and so much more! Tuesday evening there will also be a great networking Defense Social being held poolside from 6:00-8:00 pm that you do not want to miss! Again, you can find STS Aviation Group at Booth #509. David Burgett (Sr. Manager of Military & Technical Sales) from STS Air-Pro will be on site to discuss all of your C-130 and other military aircraft and ground vehicle support requirements. STS looks forward to being a part of the 2018 C-130 TCG International where suppliers, manufacturers, and other industry experts connect to make critical strides within the defense industry. Remember to fly by Booth #509 to meet the STS team. We look forward to seeing you in Orlando!